The QNAP REXP-1000 Pro expansion enclosure is designed for expanding the storage space on the Turbo NAS by connecting multiple expansion enclosures via high-speed mini SAS cables. This is especially useful for large data applications, such as video surveillance, data archiving, and TV broadcast storage. Note: A 12 Gb/s SAS expansion card (P/N: SAS-12G2E) is required if the NAS does not have Mini-SAS ports. An external Mini-SAS HD SFF-8644 to Mini-SAS SFF-8088 Cable (P/N: CAB-SAS10M-8644-8088) is required for use with the SAS 12 Gb/s port and the transfer rate over the cable will be 6 Gb/s. Simply connect a REXP-1000 Pro to a Turbo NAS and power it on. The Turbo NAS will detect the hard drives in the REXP-1000 Pro as newly installed local drives. 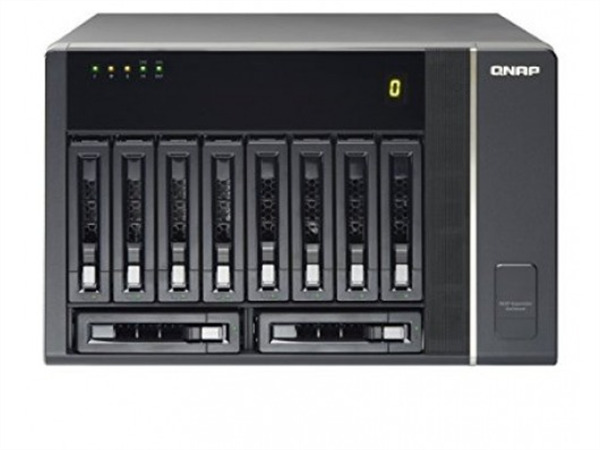 The Turbo NAS capacity can be expanded seamlessly by using the powerful QTS Storage Manager. The REXP-1000 Pro supports 10 hard drives and has two SAS wide ports (IN port and OUT port) for host connectivity and daisy-chain respectively. Each SAS wide port combines four SAS channels (maximum 8 SAS channels supported per expansion enclosure). The solution delivers unprecedented performance of up to 24Gbps per host connection.